A very nice Mourvèdre Kudos to the Domaine de l'Ocelle for this Cuvée Lagarto 2002, a 10-year-old Mourvèdre (majority, says the back label). We had got this bottle somewhere near 2005 as we dropped one day unanounced to visit the estate. Arnaud Warnery couldn't stay because he had to drive his son for an important exam, and he just gave us a few bottles including this one, which we aged carefully. The wine has obviously matured with a red color bordering the tile, but in the mouth it's beautiful and refined, the wood and tannins beautifully softened by the years. B. notes aromas of plum, sherry, aromats and pepper, with some hints of cedar coming maybe from the wood. The back label says that this is a Coteaux du Languedoc AOC, and that the wine stayed several months in barrels, for a total volume of 1700 bottles (6 casks maybe). The Domaine de L'Ocelle sits near the village of Saint Christol south west of Nimes. Le Blanc du Clown 2006 (Anjou) In spite of it non-conformist label, Jo Pithon's Le Blanc du Clown is an Anjou AOC, but these people aren't too forward on these details I guess. We had this wine recently on our table and I learned that the wine is a blend made from the two best casks of Chenin that Jo Pithon picked in different terroirs : Rochefort, Beaulieu, St-Aubin et St- Lambert. This chenin had an élevage of 12 months in cask and the cuvée makes a total volume of 600 bottles, quite confidential. Apart from a SEO trick to bring Japanese visitors to this site, the quote helps highlight how the Japanese are serious when they report and write on wineries, they don't stay on the outside of things, going deep for the source. The other day as I was driving in the Loire by night, I killed a roe deer, and can you believe that ? It just jumped in front of B. 's car without any warning, that was a couple seconds after I had spotted a first one on the open field through the car's lights. The shock was quite big at the level of the front bumper and the radiator grill. I stopped immediately and as it was dark all around I didn't know if the animal has escaped unscathed or was wounded, I just stopped and must admit that I was primarily worried about the condition of B. 's car which I had borrowed from her for the weekend. I checked the front of the car and it didn't appear to have suffered any damage, then I began to look around with my flashlight, and soon found the roe deer which had just fallen into the deep side ditch on its momentum. The poor animal had obviously sustained life-threatening injuries even though nothing was visible from the outside. It still moved the head a bit but was to die quietly in the following minutes. I couldn't leave the animal like that and I decided to call someone I knew and who could do the job of skinning the animal and cutting the good meat parts. He wasn't at home alas so I thought about someone else whose phone I couldn't find, so we just left the animal in the ditch, it was so deep that passing cars couldn't spot it. I just tied a plastic bag to the nearest telephone pole to be able to find the place when we would be back. The guy was at home and was OK for the special op, so we drove back, took the animal into my trunk and drove to his hunting lab where he could do all his expert butcher job. No picture there because it's a hot topic, we're not supposed to just pick the animals crashed on the road and put them into the freezer. The guy is very friendly and wanted to give me the whole thing but I insisted that a gigot would just be fine. Here is a tool that may be useful for many of you when you're trying to locate a French appellation area in a given region or in the context of its neighboring appellations. B. and I use this large paper map when on the road, it is convenient like a Michelin road map and with the major roads being superimposed on the wine AOC areas, you can visualize where the regions (which are often tiny) start and end. When unfolded, the map measures 1 meter by 1 meter, plus additional and more detailed information about the appellations. This French appellations map costs 7, 01 € and it can be ordered online. I didn't check if IGN ships abroad but I guess so. The additional 0,01 € is not very smart but IGN is a public-sector company, so be understanding...You must first register and create an account before ordering the map. If this is too much trouble, try to order it on other sites instead (Google : IGN 915 vins de France) like here or here on Amazon (temporarily soldout), or even on Ebay. The odd thing is that it's cheaper than at IGN... Drinking Champagne in a milk-centered exhibition We went recently to the opening of an exhibition by photographers Akiko Ida and Pierre Javelle, two artists and photographers whom we befriended many years ago. Akiko is a long-time food photographer and she and her husband Pierre have specialized in installations using miniature characters in a food context. They found their brand name, the Minimiam, miam being a French word for "I want to eat that", and they have already a long history of creation with miniature figurines in food scenarios, all sort of foods. This time they worked for La Milk Factory which from what I understand is a communication agency doing the promotion of milk products on an artistic way. On this Telegraph page you can see Akiko & Pierre but also quite a few of their food-centered miniature installations (click on the side of the picture to see the next or previous picture). Make sure to visit this exhibition, it will be running until may 18 2013 at 5 rue Paul Bert in the 11th arrondissement, in a stret where you'll find many quality restaurants and bars with nice wine, beginning with the famous Bistrot Paul Bert. The thing is, you usually serve wine at the opening of an exhibition, and the organizers wondered I guess how they could find something evoking milk without having to serve milk : they chose to offer Champagne in white glasses, and this Champagne had a distinctive character, it was a special Pommery cuvée named Pop Earth, a very enjoyable bubbly which is marketed as being eco-friendly, having needed 0,5 liter of water per bottle instead of 1,67 and bottled in slightly-lighter bottles (but not as far as being organic). Notwithstanding the boring greenhouse-gas narrative, the Champagne is enjoyable as said, fruity and light with a not-so-dry feel which I like, plus with aromas of apple and citrus. I've since a long time myself been fascinated by ermits who in our modern times still look for the solitude of forests. At the time of the Unabomber story I had been intrigued by this educated man who had at one point settled in a remote cabin in Montana, the guy had turned crazy somehow with his bomb-parcel terror but his manifesto looked quite interesting and well thought, from the few chapters I read. When I'm staying in the Loire I'm also enjoying a technology-less place where the fire in the wood cookstove becomes the center of the world. I'm not yet into assembling wires and powder but it's already one step toward the cabin in Wyoming or in the Ural where I'd like to try myself into that kind of life one day. Sylvain Tesson's book is enriching and for those who want to know more about the Russian soul, it is also very informative because he comes into contact with fellow cabin dwellers living at several days walking distance. The guy is a free-minded non-conformist and his writing reflects a deep refexions on many issues, beginning with what is really important in life, something about which the Russians, with their deeply-affective approach in life, can bring a lot to us, rational Westerners. My own experience of the Russian forests is one of wonder and dream-like discovery, and even though few Russians make the leap to settle for months or years in a cabin, most share this quasi-mystical love for the pûrity and grandness of mother Nature, going there every year in the endless forests to collect berries, plants and mushrooms. Here is another video about Sylvain Tesson like on the Baïkal. Short interview in French, back in Paris From Russia, with love These were hot news a while ago in Russia (here the news page of Mail.ru) : Gerard Depardieu had been granted the Russian citizenship. And from what you could read in the French mainstream media and hear from the French government officials, it was as if geopolitical realities had turned around 180 ° compared with 30 years ago : France was eerily looking like the Soviet Union of the 1970s', bashing its exiles and denying the reality of a French exodus of talents and entrepreuneurs. And Russia, which btw has been despised by the French elites for years had committed the ultimate insult for the Gallic sense of superiority by granting its most successful actor the Russian nationality. An independant-minded observer couldn't but think to very similar situations that were routine in the late 70s', just that the roles were now inverted. Like in the Soviet Union of this bygone era, there were probably a few open-minded French officials or artists who thought privately that he maybe was right to settle abroad, but obviously they didn't dare to tell their thinking by risk of loosing their job or being demonized. I think it's quite rare to see the History turn around so rapidly and in such a comical way. This said, and speaking about wine, Depardieu's friendship with the russian president could become very profitable for Russia, as Gerard Depardieu could convince authorities there of the benefit for Russia to allow Russian artisan vintners to prosper and sell their wines freely. Beyond the understandable tax-flight reasons behind this move to Russia, I think that Depardieu is very Russian deep inside : like the Russians, he is a person where empathy and friendship come first, someone who doesn't count when he loves and when he wants to help people (according to the testimony of his business partners in France), and most of us have discovered that he knows Russia much more than we could imagine. Pictures & news credit : ITAR TASS, RIAN, AP. Russia to lift ban on Georgian wine par aljazeeraenglishRussia lifting ban of Georgian wine Warming relation in the Caucasus : Russia is lifting its ban on Georgian wines after several years of blocus following border disputes aroung South Ossetia. Many people in Russia complained about the embargo, and I spoke to a restaurant owner in Russia who said professionals had been going around the embargo anyway, using routes through third parties like Belarus to get Georgian delicacies, as Georgia is also known for its prime ingredients for cooking and fine food. More seriously, This Russian shift comes at a time when Georgia has been yielding better wines, which should benefit the Russian consumers as well. But other hurdles wait in the way of the comeback of Georgian wines in Russia, particularly the one related to the administrative processing of the wine samples which are checked by the Russian body Rospotrebnadzor (the food safety agency). In this Novosti article (in English), we learn that the administration has cleared 36 Georgian wineries, but the difficulty to get a visa from Russian authorities is also a problem for the Georgian winemakers who want to bring their samples. Rospotrebnadzor is doing everything it can to ease the problem and according to this article from their site, they are lobbying with the Russian government to speed visa procedures for the Georgian winemakers. Things are going better but should still improve on this regard. Yuzu & Sansho Here are two cooking ingredients that our friend Junko brought us from Japan a while ago, one small bottle of powder and three fruits wrapped in a neswpaper page to keep them fresh and secure. Both of these ingredients are unique in their style and expression, and inimitable, and I didn't know about them until recently. When you experience the power of even small amounts of such ingredients in a dish, then you understand that the taste is a mysterious thing. We used the three fruits one after the other to use their peeling parsimoniously here and there, sparing them like a treasure. The yuzu looks like a clementine, it is a small citrus where everything counts, beginning with the skin which you peel to give taste to a dish with just a few chips. The fresh taste of yuzu survives a cooking. Of course the cook has to be talented (B. belongs to that category), but the ingredient itself was given by mother Nature such an aura that I tend to think that anyone will improve his/her food with a bit of this miracle fruit. Sansho is another miracle ingredient, and the first time B. prepared a dish with it, I didn't know first but noticed this incredibly fresh and intriguing feel. I asked her what caused this and she told me it was sansho. If you pass close to one of these ingredients, grab them, because even if you improvise, you should be nicely surprised by their use. The Salon des Vignerons Indépendants in Paris Don't miss the Salon des Vignerons Indépendants at the Porte de Champerret in Paris, next march 22 to 25. This is the spring equivalent of the larger wine fair that takes place every november at the Porte de Versailles. For just 6 € you can taste for free the wines of hundreds of independant wineries from all the French regions including Champagne and Cognac... Many Parisians come here to purchase cases of wines from their favorite wineries or from random picks that they discovered through a tasting. I haven't been for a while but it's a very pleasant experience. Avoid the weekend though because it's crowded, week days are much better. Dress lightly because the temperature rises with the crowd and you'll be obliged to carry your coat on your arms, not easy to navigate among the crowd. 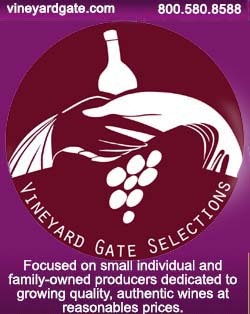 Check on this page through the appellations filter which estates are taking part. A pity that Depardieu's "warm heart" seems to have blinded him to the fact that his other new friend in Russia -Ramzan Kadyrov- is a ruthless tyrant and a murderer (as well as a promoter of islamic conservatism by the way). I didn't really want to make political comments on this blog, but you started! Please lay off the politics and stick with the wine.